This traditional nougat recipe features the flavors of pistachios and delicate rosewater. Rosewater can often be found in the Middle Eastern sections of grocery stores or in specialty food stores. 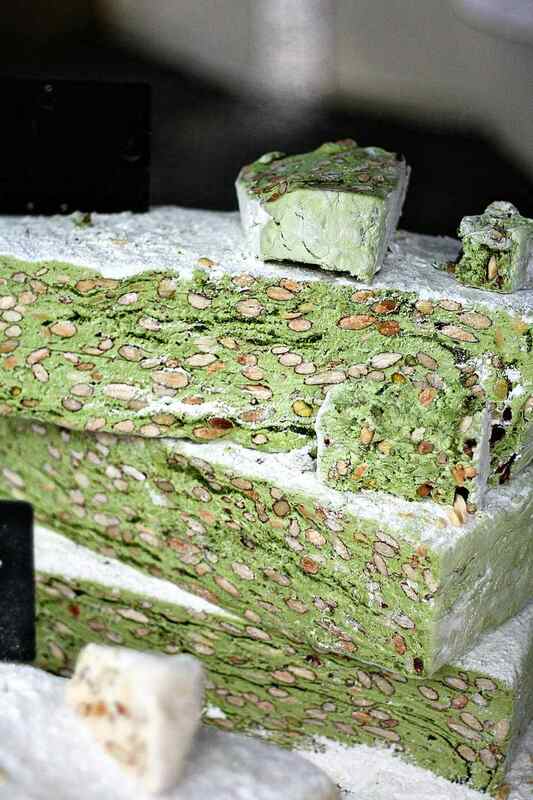 Don’t miss the video showing How to Make Persian Pistachio Nougat! Prepare an 8x8 pan by lining it with aluminum foil and spraying the foil with nonstick cooking spray. Place the egg whites in the bowl of a large stand mixer, and whisk until they hold stiff peaks. While the whites are beating, combine the sugar, corn syrup, salt, and water in a large saucepan over medium-high heat. Stir until the sugar is dissolved, and continue to cook until the mixture reaches hard-ball stage (250 F). When the sugar syrup has reached 250 F, remove it from heat and slowly pour approximately one-quarter of the mixture into the stiff egg whites, with the mixer running constantly. Continue to beat the egg whites until the mixture holds its shape. Return the saucepan with the remaining sugar syrup to the stove, and continue to cook over medium-high heat until the mixture reaches 300 F (hard-crack stage). With the mixer running, pour the remaining sugar syrup slowly into the egg mixture and continue beating until mixture is thick and stiff. Add the rose water and nuts and beat just until combined. Spoon the nougat into the prepared pan, and press it smoothly and evenly. Keep it in refrigerator until the nougat is set. Take it out of the mold and cut it into squares. Store nougat in an airtight container in the refrigerator, but allow it to come to room temperature before serving. Click Here to View All Nougat Recipes! Who Needs Peanut Brittle? Give Macadamia Nut Brittle A Try Instead! What Are Some Pecan Candy to Make at Home?